Carlisle: Mexico deservedly beat U.S.
Five key Mexico players vs. U.S.
PASADENA, Calif. - "I'm still the King," read the tifo Mexico fans unfurled ahead of Saturday's match against the United States and, at least in terms of representing the CONCACAF region at the Confederations Cup, El Tri is still the top dog. Mexico had a sweetly struck volley from Paul Aguilar in the 118th minute to thank for a 3-2 victory against the U.S. in the CONCACAF Cup, sending El Tri to the Confederations Cup in Russia in 2017. 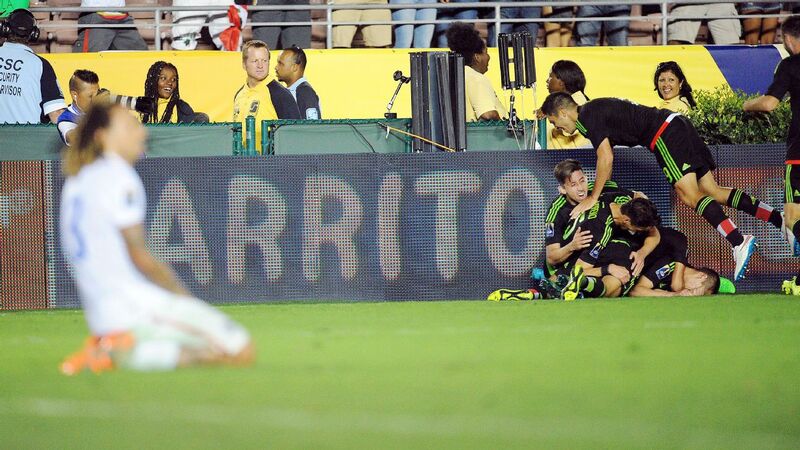 Javier "Chicharito" Hernandez opened the scoring for Mexico in the 10th minute with a goal oozing quality before Geoff Cameron headed in the equalizer five minutes later in front of 93,723 fans in the Rose Bowl. It wasn't until the first half of extra time that Oribe Peralta put Mexico back in front, but the United States refused to give in and Bobby Wood leveled in the 108th. U.S. national team coach Jurgen Klinsmann claimed that he wanted to convert Mexico fans in a packed Rose Bowl into U.S. fans during the game. After 30 minutes, that seemed a distant dream. El Tri started like a team two leagues above the U.S., passing the ball around, opening the U.S. up and dominating the game with finesse and talent. The reward came in the 10th minute. Aguilar passed the ball inside to Peralta, who dummied it, spun away and received Raul Jimenez's back-heeled return pass. With only goalkeeper Brad Guzan to beat, Peralta squared for Hernandez, who tapped in. The goal was every bit as good as the one Giovani dos Santos scored in the same venue at the 2011 Gold Cup final. It was a reminder of all the good things about Mexican soccer. The fast one-touch technical passing left the U.S. defenders dizzy. But if the goal highlighted the positive stereotypes about Mexico, the U.S. equalizer showed the negative. Cameron was left unmarked from a Michael Bradley free kick from the left and the big center-back headed it in. Before that, the U.S. had done nothing. But that goal changed the game. The Stars and Stripes grew into the match. It turned into a pretty even match with both teams spawning good chances to win within the 90 minutes. Interim coach Ricardo "Tuca" Ferretti's plan to employ a 4-3-3 system seemed to have caught the U.S. off-guard early on, but Klinsmann's team gradually adapted to the fluidity from Jimenez, Hernandez and Peralta up top. Peralta thought he had won it for Mexico in the 96th. Hector Herrera filtered an inch-perfect ball down the right, which Aguilar steered first-time into the center, where Peralta was on hand to finish. Once again, it appeared to be game, set and match Mexico until Wood leveled in the 108th. Aguilar, however, had the last word in an epic battle, hitting a controlled volley in to steal the points. It was a goal worthy of winning a game that will live long in the memory. Mexico are on their way to Russia following Saturday's dramatic win over the U.S. The heavyweight duel between Mexico captain Rafa Marquez and his opposite number, Bradley, provided the key battleground for the game, which goes down as another classic between the two CONCACAF rivals. Marquez, playing possibly his last game vs. the U.S., was used by Ferretti in a defensive midfield role, dropping back as the last man and commanding his team. The Hellas Verona player seemed to have more touches on the ball than anyone else and was straight in there calming things down when Guzan and Peralta were involved in some pushing and shoving during the first half. For the first 30 minutes, which Mexico dominated, Marquez started all the moves and seemed to be in control of the whole match. Bradley struggled to get on the ball. Gradually, however, the Yank began to exert his influence, bursting through midfield and creating a chance for himself in the 32nd. The Toronto FC midfielder also sent in the free kick from which Cameron headed in the equalizer in the 15th and seemed to cover every blade of grass on the pitch. He was once again a thorn in Mexico's side. It always seems so obvious that the key to El Tri beating the U.S. is through neutralizing Bradley, but that's easier said than done. Marquez waned slightly as the match wore on and had to be substituted out. While the 90,000-plus fans -- most of whom were supporting Mexico -- were probably a little too emotionally involved in the game to appreciate it on Saturday, when the 36-year-old exits the scene and isn't involved in these clasicos against the U.S., his presence will be sorely missed. In what was his final Mexico-U.S. game, Rafa Marquez emerged triumphant. Mexico's incoming Colombian coach Juan Carlos Osorio watched on from a private box inside the Rose Bowl. He will be happy to have the necessary talent at his disposal to start his new job with a degree of positivity. Off the field, he witnessed a capacity stadium in the U.S. with passionate fans urging Mexico on. On it, the group has come together under interim coach Ferretti, who stated he had been surprised at the human and playing qualities of his squad. The atmosphere around the team has been good, following Miguel Herrera's untimely departure, and Mexico can now ink in the Confederations Cup in 2017 as part of the preparation for Russia 2018. Ironically, a couple of positive results in the upcoming World Cup qualifiers against El Salvador (in Mexico) and Honduras (in Honduras) this November, and the year will have been a success in terms of goals achieved. Mexico won the Gold Cup, has qualified for the Olympics and is now in the Confederations Cup.